This year I’ve been to so many conferences I’ve had the opportunity to observe dozens and dozens of female speakers. They are funny, articulate and have insightful messages to deliver (as do the men). But women, more than men or long-time female public speakers, tend to choose clothing that makes them look uncomfortable on stage and looking uncomfortable detracts from our message. Wearing a dress – dresses restrict movement and expressive body language that can help you make your point. Additionally, knee-high dresses are especially hard to cope with when you are on a panel, perhaps perched on a stool on stage above the audience. Wearing high-heel shoes – most of us don’t wear high-heeled footwear on a daily basis anymore. Some women drag them out for conferences and end up tottering around the stage or session room. Wearing a one-piece outfit – like a dress, a one-piece outfit leaves no place to hook a microphone or the transmitter. I’ve seen women place the transmitter on a table and hold the microphone vaguely toward their mouth or clip the microphone to the dress right under their chin and hold the transmitter in one hand and the clicker in the other all of which restricts movement and hurts the sound quality. Thick blazer – I go for a slightly tailored but also slightly lose fitting, thick blazer. A blazer serves a number of different purposes. It hides lavaliere or headset microphone wires. The thickness of the blazer also hides the bulky black transmitter box. Most blazers give you a suitable place to clip the lavaliere microphone. Blazers with color or big designs are great for hiding or repelling most accidental breakfast or lunch time spills. If you sweat slightly under pressure or in the heat of the lights or during an inopportune hot flash, blazers hide that too. Belt – The microphone transmitter weighs about a pound and can drag down slacks or a skirt but a nice sturdy belt will prevent that from happening. Belts also allow you to choose where the transmitter rests. Women with dresses sometimes find they can hook it on the back of their dress but this means they can’t turn it on and off by themselves. I like to hook it under the front left flap of my blazer, the same side the microphone is hooked to, and tuck all the wires into my pants. Placed in the back, I can’t turn it on and off or see that it is on or off. Placed on my hip, I bump it often which brings my attention away from the presentation. Placed in the front slightly left toward my hip and securely under my blazer is optimal because I soon forget it is there. Comfy shoes – Thinking about trying not to fall off the stage or dwelling on how much your feet are killing you makes it hard to focus on your presentation and the audience. Instead of high-heels I choose black loafers that help me feel stable on stage and are comfortable enough to walk all day through even the biggest conference centers. Quiet necklace – Some necklaces make pretty little tinkling sounds which might be fun at another time. On stage the microphone picks up every little sound we make. Picking the right costume is just one part, although I think an essential part, of feeling more comfortable on stage. If public speaking is something you plan to do more of, practice is another essential part. Start speaking at every conference you can or to practice with relative anonymity find the Toastmasters Club for you by auditing the local groups in your area. 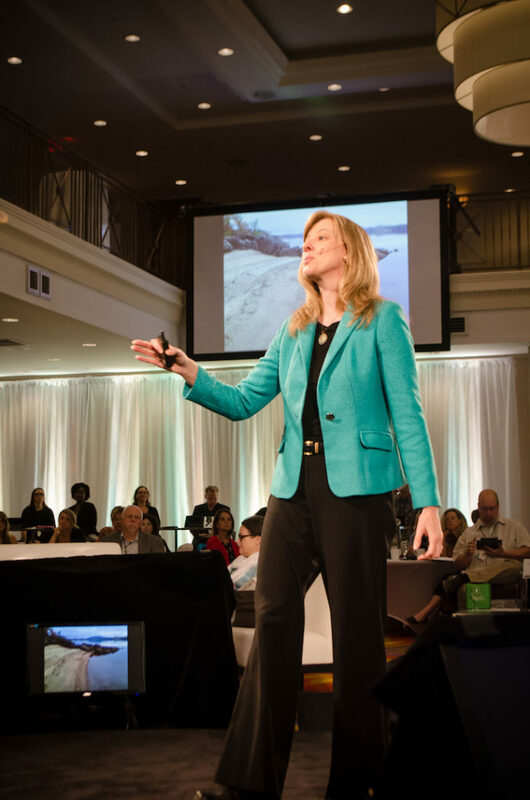 Are you looking for a speaker to talk to your audience of association professionals? I do that!